Grace Presbyterian Church was organized in 1893 as Cumberland Presbyterian Church, by J. J. Grant and Dr. A. C. Scott (of Scott and White Hospital). The church joined the Presbyterian Church in the United States of America PC(USA) in 1906. 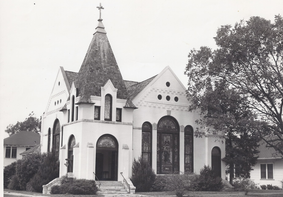 The original church was located in downtown Temple on the corner of Barton and Third Street and was used until 1965 when our current building on 57th Street was built. The church name, Grace, demonstrates we recognize God's unconditional love and forgiveness in our lives. The empty cross in our Sanctuary reminds us that our God in Jesus Christ is living among us. Following the example of Jesus, we are committed to meet the spiritual, emotional, and physical needs of our brothers and sisters here and everywhere. By showing God's love in our lives and sharing His love with others, we hope to glorify God and make disciples of others. GPC is a cohesive congregation which is inclusive and compassionate; slow to judge and quick to love. Our Mission Statement - By the Grace of God in Christ Jesus, the Spirit is among us, to magnify the name of the Lord, make disciples and meet human need.